How's your week going? I'm having an interesting week. Yesterday I bought my first laptop computer. I'm typing this post on it right now. I have a desktop in my office, but I wanted to be able to sit in the living room with Sweetheart and do some blog management or type a post. A new learning curve with Windows 8. That's all the new news about me. Now on to Golden Gate Park in San Francisco, California. After spending a few hours visiting the Japanese Tea Garden, Go Here. 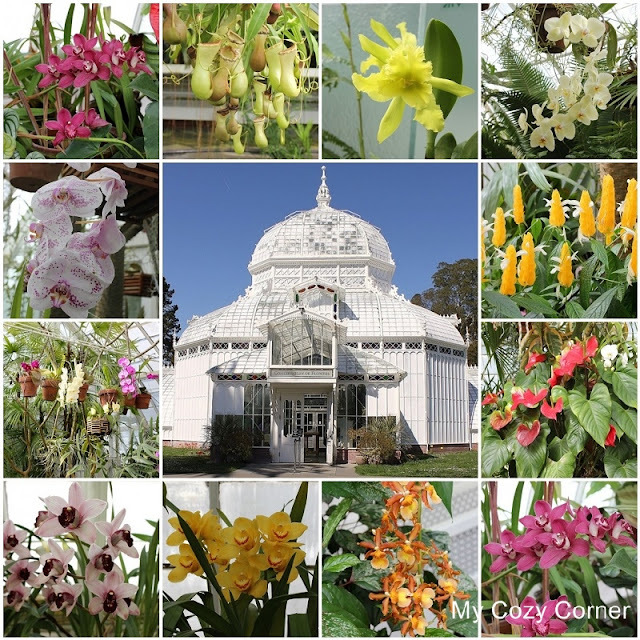 Sweetheart and I drove to the beautiful Conservatory of Flowers building to see the most beautiful tropical flowers and the most amazing Victorian building. The flowers in the front of Conservatory are planted twice a year. The caretaker shared with me that they just finished the spring planting..
1877 San Francisco businessmen purchase Conservatory from James Lick's estate and offer it to the Golden Gate Park Commission as a gift. 1833 A boiler explosion destroys the main dome. Charles Crocker donates funds to restore the dome. 1906 Conservatory survives the earthquake intact. 1946 The Conservatory is reopened to the public. 1998 With the support of First Lady Hillary Clinton, the World Monuments Fund places the Conservatory on the list of 100 most endangered world monuments. 1999 $25 million restoration campaign begins. 2010 Since reopening over 1 million people have visited what is now the oldest public glass and wood greenhouse in the United States. Can you see Sweetheart admiring the beautiful building? I hope you have enjoyed the tour of The Conservatory of Flowers. How lovely to share this - I have been to San Fran 3 times since a friend moved there and did go here but it was a colder winter day and not so bloomy as sometimes. Beautiful flowers and glass house! Thanks for sharing! This is awsome. It reminds me of the conservatory in San Diego. Så mycket fint ni har hunnit med att se på er resa. Så kul att läsa om det. Det är det som är bra med bloggen man lär sig så mycket om andra länder. Här firar vi Påsk denna helgen med god mat samvaro och godis förstås. This conservatory is so beautiful. Thanks for sharing. I had no idea it even existed. What an absolutely gorgeous place to visit! Thanks so much for sharing it with us...and for linking it into my little party this week! I hope you will link in and share again soon...and often! I am also sharing this post on the Tootsie Time Facebook page! I started a comment. I wonder where it went? Anyhow, this is a awe-inspiring place. Did it inspire you to go home and buy orchids and put up a greenhouse? Thank you for taking us along on your visit. Yes we enjoyed it, thanks so much for the tour, and the collage of everything you saw!